Loads of new and updated Pilates Back and Joint Exercise information added each week just for you! 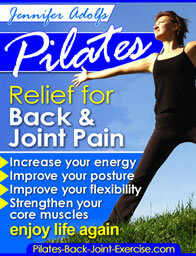 Continue reading "SI Joint Pain Improved with Pilates!" Continue reading "Hip pain after 4 months of Reformer Pilates"
Continue reading "Exercise for People with Scoliosis"
Continue reading "Lumbar herniated disc"
Continue reading "SI PAIN TREATMENT "